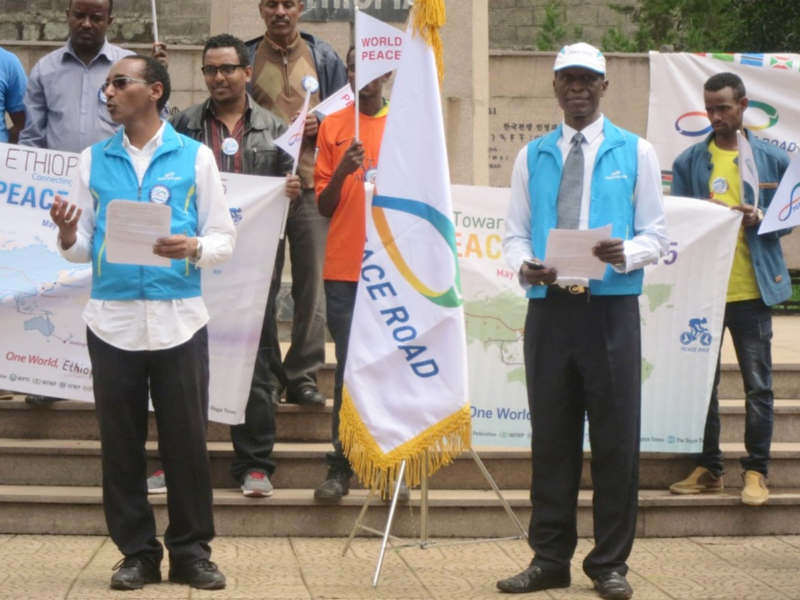 FFWPU Ethiopia: On July 25, in Addis Ababa, Ethiopia held the Peace Road under the theme “Ethiopia… a Peace Keeping force nation for the world & Dedicated to bring unity and development in Africa” The Peace Road was done in partnership with the Korean War veterans. Ethiopia is the only African nation with South-Africa to participate in the league of the 16 nations to fight and push back North-Koreans invasion by sending 6035 soldiers. Ethiopian soldiers got themselves noticed by fighting so bravely that not even one was made prisoner during the war. 122 soldiers have lost their lives for the sake of Peace & Unity in Korea. Participants started by gathering in front of the monument for veterans from 10 am. At 11 am, the Event began with the veterans offering respect salute to the Peace Road flag. Rev. Bakary Camara, the Continental Director for Eastern and Southern Africa brought the Peace Road flag himself that used in South Africa, the departure of Africa Peace Road. Mr. Simon Amare, secretary general of UPF Ethiopia welcomed all the participants and then, simply used the Press release to explain the purpose and significance of Peace Road. After his opening speech, Rev. Bakary Camara handed over the Peace Road Flag to one of the Ethiopian Young Peace ambassadors Mr. Ephrem Tadess. Then, the Peace walk started and all participants were singing an Ethiopian song called “SELAM (ሰላም)” during the PEACE ROAD Walking. SELAM meaning PEACE in english. At the end of walking, Lieutenant Aklilu, the Korean War veterans offered a remarkable speech on the task role played by the Ethiopian soldiers during Korean War. Finally, an elder Korean war veteran offered a closing prayer. The event ended with all participants singing “Uri e Sowon” and offering 3 cheers of Mansei.